US-backed Syrian Democratic Forces (SDF) don tok say di Islamic State's "caliphate" of five years dey come don end as dem don defeat di militants for Syria. 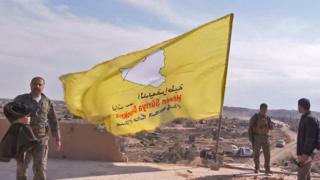 SDF fighters raise victory flags for Baghuz wey be di last stronghold of di jihadist group. For di top of dia reign, ISIS control plenty land wey reach Syria and Iraq. But even though dem don lose di territory, di group still remain global threat. ISIS still get presence for di region and dem get affiliates for Nigeria, Yemen, Afghanistan and di Philippines. American officials believe say ISIS still get 15,000 to 20,000 followers for di region wey dey armed and many of dem dey undercover. Even as e clear say dem go soon defeat dem for Baghuz, di group still release audio recording wia dem tok say di caliphate never finish. Terror alert: Nigeria airport security tight?